At this time of year, you may be suffering from berry-envy, seeing autumn raspberries ripening in allotments. But with a little forward planning, and buying the right cultivars, you too could have raspberries through most of the summer and autumn. They are not difficult to grow, although they can take a while to establish, and raspberries are enormously satisfying to grow because they just taste so good straight from the canes. Raspberries really like moisture-retentive, fertile, slightly acidic topsoils, particularly if they’re weed-free, and prefer full sun. They don’t like waterlogged soils or chalk. This makes them pretty easy to grow almost anywhere, even in part shade. They are generally grown trained on a fence or system of wires, but they are pretty flexible and you can even grow them in containers if you are a bit short on space. You can plant raspberries pretty much any time between November and March, as long as you can dig a hole! Before planting, dig in some well-rotted organic matter such as compost or manure, and add some slow-release general purpose fertiliser. Plant your canes about 45-60cm apart, along a row, and then cut them down to about 25cm tall as soon as you have planted them. You will need a fence and wire system to support the plants. The usual arrangement is to use posts about 15ft/5m apart and stretch wires between them at two or three heights, usually about 60cm apart vertically. 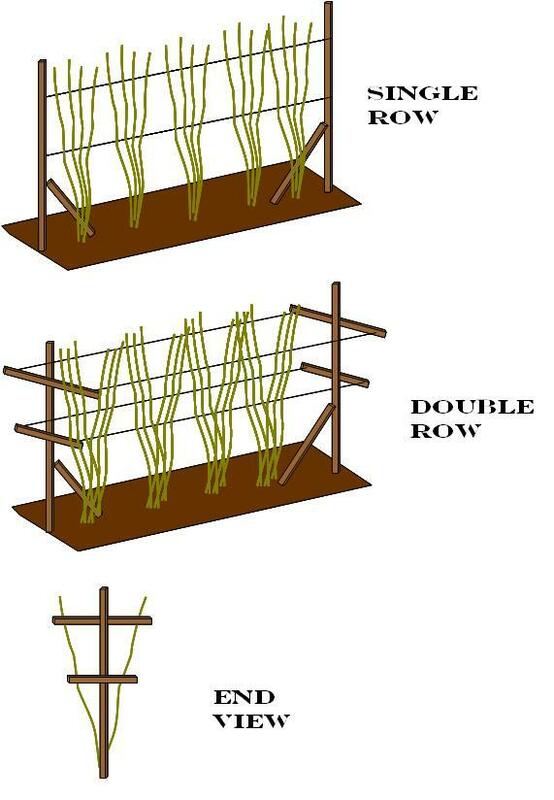 This system is supposed to allow you to tie in the old canes to one side, and the new canes to the other during the growing season, so that you can easily separate them in when you come to cut them back. However, raspberries sucker and you will probably find that the new shoots pop up all over the place! If you only have a small garden, you can use a single post, and grow three or four canes around it, tying them all into the same post. You will need to prune your raspberries every year for best results. For summer raspberries, cut down all the fruited canes after harvesting, and tie in six to eight of the new canes per plant. Cut all the rest down to ground level. Autumn-fruiting raspberries need to be cut down to ground level in February. You can thin them again in summer if they look too crowded. It can be very helpful to mulch along the base of the raspberry canes with a thick layer of bark chippings (click here to buy bark), which you can buy from garden centres or compost or topsoil suppliers (buy topsoil here). This keeps in the moisture, and also stops too many weeds from taking hold, and the raspberries will benefit from both!